Dark red head, neck and sides with white lineback. Straight Butler cow. 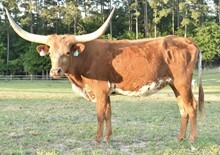 Her pedigree goes back to O'Neil family on top and bottom, who produced the first 70+ inch cattle in the breed. 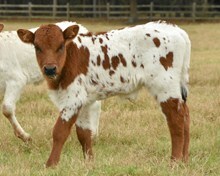 Artificial Insemination Cowboy Chex Produces long-horned offspring.